We’d love your help. 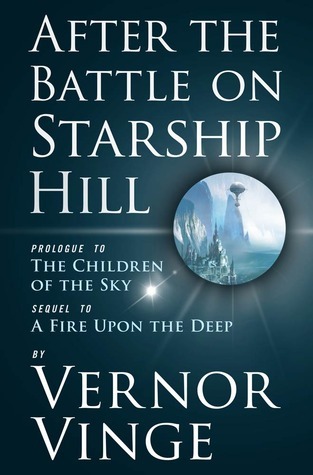 Let us know what’s wrong with this preview of After the Battle on Starship Hill by Vernor Vinge. "After the Battle on Starship Hill" is more than 12000 words of prologue from Vernor Vinge's forthcoming novel, The Children of the Sky. Taking place on Tines World, this mini e-book describes events of the years immediately following the conclusion of the predecessor novel, A Fire Upon the Deep. To ask other readers questions about After the Battle on Starship Hill, please sign up. is this only going to be kindle? I disagree with the reviewers who said this was just the first two or three chapters of The Children of the Sky (CotS). There was definitely additional information on the Tycoon's henchmen, and early contact with the Tropics. I think this could have been read before CotS. It is just the first couple chapters of The Children of the Sky. I paid for an excerpt from a book that I bought anyways. Just buy the book itself. Vielleicht liegt es daran, dass es nur ein kurzer Prolog zu einem anderen Buch ist, aber ich fand es wenig enttäuschend. Die Szenen waren nicht wirklich ausgearbeitet und die Verbindung zwischen ihnen fehlte. Es gibt auch nicht wirklich ein verünftiges Ende, das Ganze hängt irgendwie in der Luft, und der Zusammenhang mit Children of the Sky ist auch nur lose erkennbar. Dies hat Vernor Vinge wohl mehr als eine Art Pflichtübung gesehen. Do not buy this excellent book. All the material is included in the full novel. It is not a prelude, it's a preview, and no longer relevant except to collectors. I haven't read any of the Children of the Sky, but enjoyed this short novella. I probably should have read The Children of the Sky first. It seemed to be incomplete. There were too many loose ends. Not a real highlight but the story made me want to read "A fire on the deepness" again. This "book" is just the first couple of chapters of "Children of the Sky". Skip this and read "Children of the Sky" instead. Very satisfying sequel of epic duration. Prequel to The Children of the Sky. Actually the first three chapters of The Children of the Sky.